I was t-r-r-embling while chatting with Points Envy, because it really was such an honor! Sure, I’ve earned and burned millions of miles and points, but that’s just a rounding error to Points Envy. I’ve always admired how Points Envy has sources everywhere and gets the scoop on the Chase Sapphire Preferred Preferred, 40X Ultimate Rewards Points outside Costco, screenshots of Delta’s best-in-class award booking process, not to mention writing fascinating human interest stories on divorces over credit card referrals. Terrible Shirts, But Points Envy Paid Us 5 Million Points (Each) To Wear Them! The Points Envy editors have been collecting points and miles since before we were born. By that we mean that in elementary school we inherited all of our parents’ loyalty account balances after their untimely demises in a series of unrelated, yet strikingly similar, freak accidents, through which more than one billion points tragically yet conveniently became ours. For some time we had been trying out different things to do while bored in first class, from challenging other passengers to drinking contests to sleeping. A few years ago, completely by accident, we discovered that blogging is a nice way to pass the time from when you get your welcome champagne to when the caviar is served. We picked the travel hacking niche because we wanted to be the best in our field without having to really try. After all, we are gentlemen of leisure. The timing had nothing to do with the economic downturn and lack of job opportunities for Classics majors. Our blog is patently amazing, but we can spell it out for your readers who either have not yet experienced Points Envy or who cannot actually read. In addition to a clever name, we regularly feature some of the most interesting and pragmatic content in the travel blogging world. We also have a fairly solid grasp of basic English grammar and a unique mannerism, in that we always use the plural form when speaking in first person. 326 Million Ultimate Rewards Points! Add some exclusive photographic content to the aforementioned greatness and you get the incomparable Points Envy. First, read our blog. Second, follow us on Twitter. Third, get an American Express Platinum card, which has no pre-set spending limit, and spend as much as you can in the first billing cycle. Then transfer the points as soon as they post and use your earnings to live a first class lifestyle abroad until the statute of limitations runs on the unpaid bill. We’ve had success with this tactic numerous times. Last year for spring break we flew to Cairo on EgyptAir. We remember it clearly because we found out the hard way that don’t serve alcohol, not even champagne. Without our beverage of choice we understandably became furious very quickly. It was how we have always imagined prison. Our anger was not quelled by the first class food or friendly flight crew and, when we arrived, we complained to such an extent that we inadvertently started a small riot in the airport. We immediately booked the next flight out on a different (alcohol-serving) airline. As we boarded, we noticed that the riot seemed to have grown substantially. Suffice it to say, our word carries weight in airports. We avoid discussing our points hobby with our “friends” because we regularly open credit cards in their names to earn tons of points; points that we use to take luxurious first class vacations without them. And our parents don’t think anything about it because they are dead. But if the IRS or any bank asks, they are alive and happily spending large amounts every month on their dozens of credit cards. Our grandparents are more or less the same. Don’t be afraid to break the law, or any rules for that matter. For example, sometimes you can just sneak into first class if you are a white (or whitish) male dressed in a designer suit. It’s helpful to check availability before trying this trick out though, in order to avoid an awkward situation. As always, it helps to be rich. On a whim, we once scribbled “For a great AMEX Platinum referral, call [redacted]” in a Lufthansa first class bathroom. The response was largely sickening, but we did manage to earn a decent number of points from the referral bonuses. We also once came up with a great plan that required the purchase of elaborate, expensive machinery. The plan didn’t work out as envisioned, but we earned a somewhat respectable amount of points in the process. We recently discovered that Iberia Avios have become a legitimate form of currency in Spain since the economic downturn, and that merchants now accept the points at a rate of ten Avios per euro. Given the ease of transferability from British Airways, this has translated into a goldmine of jamón serrano and cava for us. But mostly, we just buy more Avios. Olé! More importantly, three months ago we figured out our cousins’ social security numbers. On those rare occasions when we are not living semi-permanently in a hotel suite, experiencing a gluttonous existence in first class or relaxing in a premium lounge, we reside in a trailer. We should point out, however, that the trailer is a duplex, and that we put the entire purchase on our Starwood American Express. For a great AMEX Platinum referral, email info@pointsenvy.com. And stay tuned for our next project: Billion Mile Secrets. 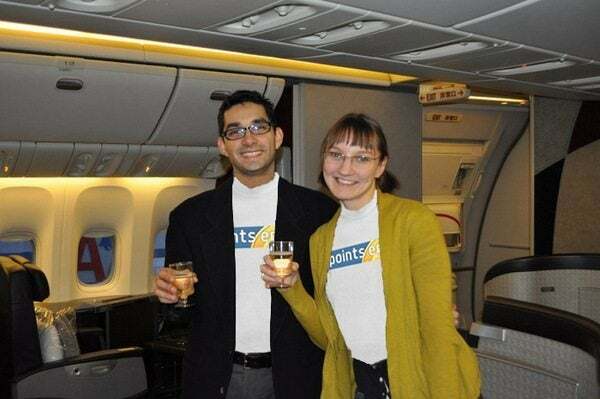 Points Envy– Thanks for sharing your thoughts on having Big Travel with Small Money! Note: This interview was satire and you shouldn’t follow any of Points Envy’s suggestions, nor should you break the law. Any resemblance to the truth is purely coincidental. 11:35 pmNovember 11, 2012 Jacki T.
It’s what your parents and grandparents would have wanted ; )LMAO….and I don’t use the “A” type of words! Is it for real? How can a person get too many points like this. It is impossible for me to reach this point level. This is Chase points. If I apply for all Chase bonus cards, I even would not reach this point level. It is impossible. Do you guys think that there is a photoshop in that picture????? As I kept reading, I kept moving to the edge of my couch, and as I reached the end of the blog I started laughing and dropped my Laptop on the floor.